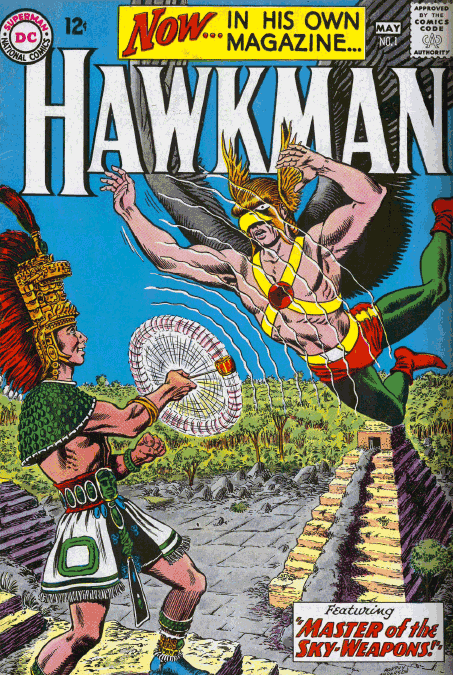 The version of Hawkman that debuted during the period 1960 - 1964: the Silver Age, looked far more like his 1940s counterpart than most of the revised heroes from this era. On the other hand, instead of being a reincarnated prince, Hawkman was now an alien cop. 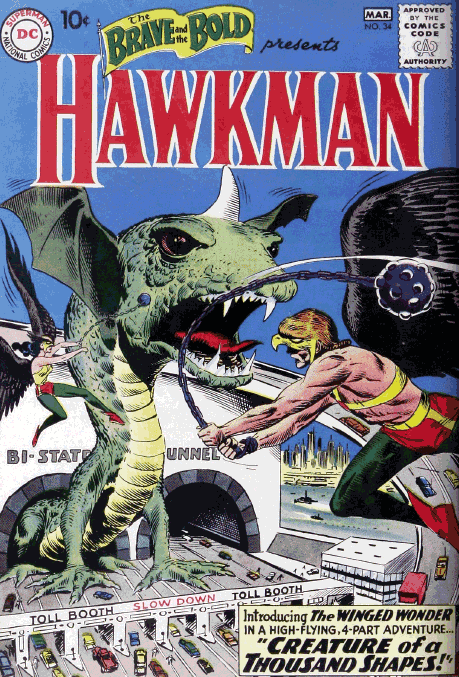 The series took a long time to take off, with two tryout runs in Brave and the Bold, and then a brief run in Mystery in Space, before Hawkman finally got his own book. 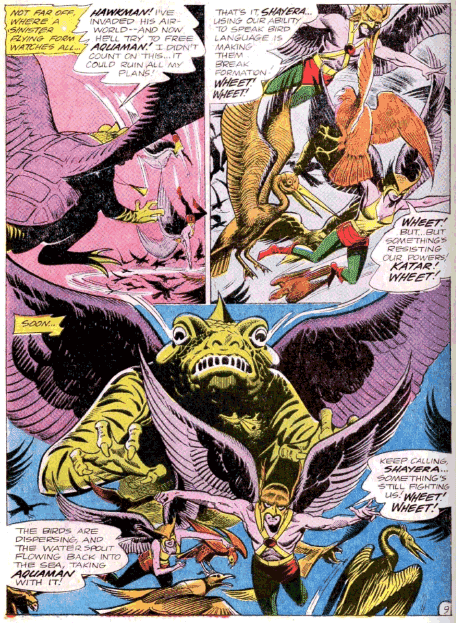 Katar Hol, the alien version of Hawkman, as well as his wife Shayera, their enemy Byth, and all of their supporting cast get introduced in a story by Gardner Fox and Joe Kubert in Brave and the Bold 34. Kubert had been the last artist to work on the Hawkman series in the Golden Age, and the costumes he and Hawkgirl wear look much the same, but with improved headgear. Still, in these first few appearances, Hawkman is missing the distinctive wings on his helmet. The origins of the pair are wildly different from the 1940s incarnations. Now Katar and Shayera Hol are police officers from the planet Thangar, who come to Earth trailing a shape changing criminal from their world, Byth. Byth actually gets introduced in the story before the Hawks do, in a really creepy opening, which feels like one is about to read a horror story, not a science fiction one. The Hawks use the Absorbacon on their ship to learn everything about Earth and its languages. Or so we are told. The fact that they later have to use the Absorbacon in other issues indicates that they selectively chose what they wanted to learn. In fact, that is hinted at right away, when Shayera seems to know about doorbells, but Katar doesn't. They introduce themselves to Commissoner Emmett of the Midway City police and explain their mission. He sets them up with human identities, of Carter and Shayera Hall, curators at the Midway City Museum, to wait until Byth does something to alert them to his presence. This takes a while, long enough that the pair begin to adjust to life on Earth. But eventually Byth tries to steal a jewel, and begins a chase that sees him change into a number of animals, both Earthly and Thanagarian. He manages to get away from the Hawks. The story also introduces Joe Tracy, the press agent for the museum, and Mavis Trent, who works there. Mavis has the hots for Carter Hall, and doesn't seem to care that he is already married. She provides a useful clue to them, when a diorama she has created includes a Thanagarian bird, alerting them to where Byth is hiding out. The big final battle sees Byth take on a monstrous form, and invade a transit tunnel, as seen on the cover. The Hawks manage to subdue him by drugging the creature, and then hitting him with medieval weapons until he passes out. They ship Byth back to Thanagar, but request to stay on Earth and study police methods on the planet. Brave and the Bold 35 sees the introduction of the Matter Master, one of Hawkman's major foes. Mark Mandrill is, essentially, an alchemist, trying to learn how to convert metals into gold. He creates Mentachem, an element that allows him to control any substance in its natural state, and makes a wand out of it. Using this, he begins a crime spree, robbing an armoured car. This gets Hawkman and Hawkgirl on the case, and they wind up having to fight creatures made out of meteors, which the Matter Master has brought to life with his Mentachem wand, using them to rob an art gallery. Matter Master sends some flowers to Mavis Trent, intending to use them to rob an Egyptian parchment from the museum. Mavis thinks the flowers are from Carter Hall. So does Shayera, for that matter. 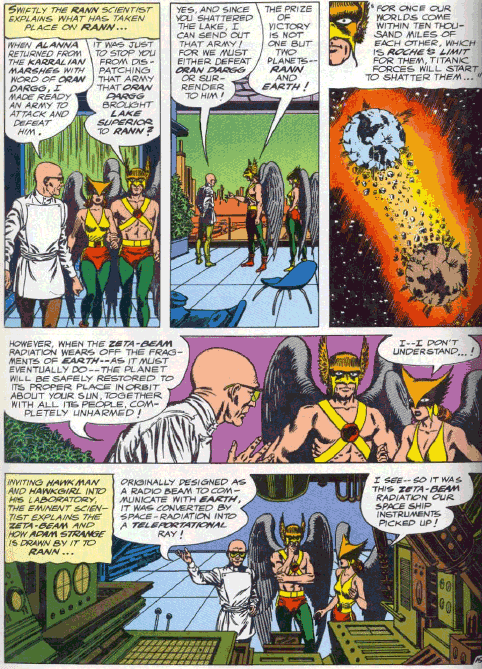 But once he hears about the stolen parchment, Hawkman realizes the Matter Master sent them. This story endows Hawkman with super-human ability to scent, and he follows the aroma of the flowers back to the Matter Master, where the Hawks defeat him. Mavis Trent also gets to play an important role in the second story in the issue, taking a movie of the Abominable Snowman, the Yeti, and then promptly getting captured by him. The camera gets brought back to Midway City, where Carter sees what Mavis had filmed. So off go Hawkman and Hawkgirl to the Himilayas to rescue Mavis. They encounter the Yetis, and learn, from the birds in the area, that they are really aliens. They crash landed long ago, and are unable to repair their ship. They kidnap anyone who sees them, using teleportation powers, and use a "glowstone" to keep their prisoners subdued. Hawkgirl gets captured as well, and Hawkman also has to deal with animosity between the Yeti and the Tibetans who live near them. In the end, rather than imprisoning the Yeti, Hawkman forges a peace between them and the villagers, although he does also turn off the glowstone to release the prisoners. Hawkman’s first run in Brave and the Bold concludes with issue 36. While this incarnation of the Hawkman character is based in science, rather than the supernatural, and most of his stories are as well, the first tale in this issue deals with magic, and a would be sorceror, Konrad Kaslak. Mavis Trent believes that she has conjured up a minotaur by reciting an incantation, although visiting professor Kaslak insists this is not the case. 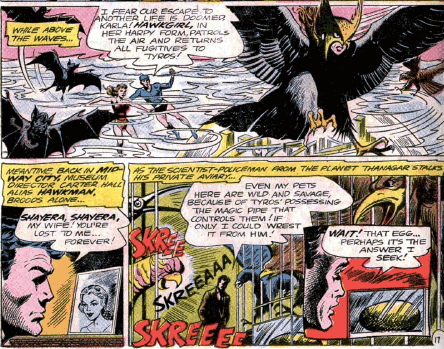 Hawkman and Hawkgirl are not sure what to think, but later encounter a phoenix, so rule out Mavis being the cause. Then they wind up facing a dragon, and notice that the creatures are stealing objects needed for a spell that will give a sorceror ultimate power. But once again Kaslak insists that no such thing is going on, that it's all just illusions. Clearly it isn't, and equally clearly Kaslak is the one behind everything. There is a lot of lovely Kubert art on this story, which helps, because the tale itself is painfully obvious from start to end. 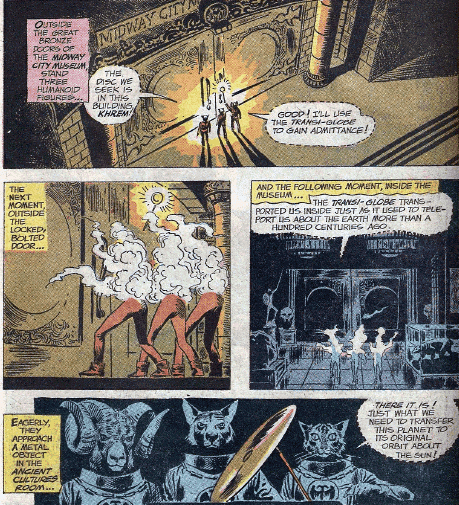 Far more important to the Hawkman mythos is the Shadow Thief, who makes his debut in the second story in the issue. Kubert does an excellent job giving the Shadow Thief a two dimensional feel, as he moves through anything and scares the crap out of people with his thefts. 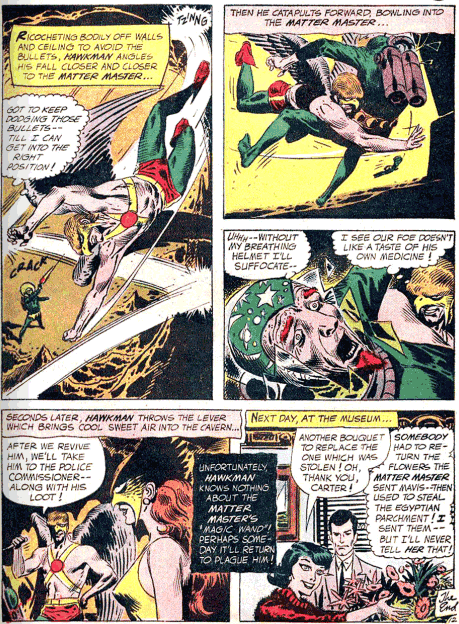 Hawkman and Hawkgirl are no more able to stop or touch him than anyone else, although they do manage to identify him as a known thief, Carl Sands. The reader learns how Sands was experimenting with creating shadows when he stumbled across another dimension, and aided a creature from that world. The being gave Sands the dimensiometer he uses to become the Shadow Thief, but warned him that repeated use would wind up triggering an ice age on Earth. Sands doesn't care at all, as long as he can steal. The Hawks have to outwit Sands into almost falling to his death, needing them to save him in order to have him become solid enough to touch. At the end of this story, the narration tells us that Hawkman and Hawkgirl return to Thanagar, and informs the reader that if they write in, the character may be brought back. Some did. Not enough to get him his own book yet, but enough that he returns in this book the following year. 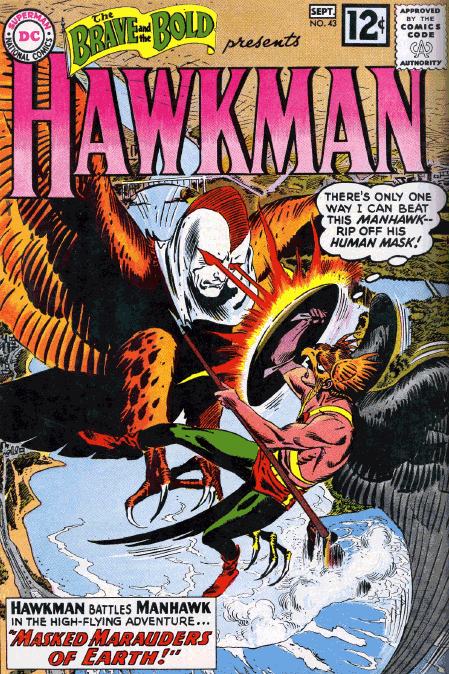 Hawkman returned for another round of stories the following year, beginning in Brave and the Bold 42. The story begins shortly after the conclusion of their last adventure in this book, as Hawkman and Hawkgirl return home to Thanagar. We meet their superior officer, Andar Pul, and spend the entire issue on their homeworld, learning a fair bit about Thanagar and its customs. Curiously, at one point the planet is called Ranagar instead of Thanagar. This is undoubtedly a simple mistake, but unintentionally hints at the later connection between the planets of Thanagar and Rann, which will develop over the years through the Hawkman and Adam Strange series. 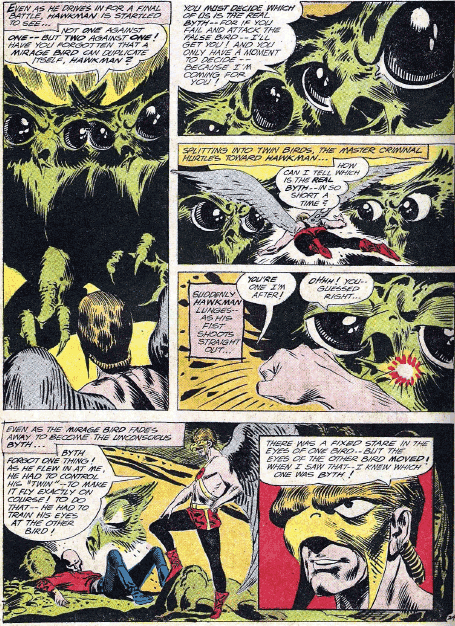 Soon after returning to their world, Hawkman and Hawkgirl go into action against thieves riding giant dragonflies. They capture the thieves, but to their surprise the dragonflies go on to complete the crime themselves. They discover that the supposed thieves are really just androids. Hawkman suspects that Byth may be the actual villain of the story, and the reader gets this confirmed, learning of how his shape changing drug was smuggled in to prison by his buddy Jarl. As Hawkman and Hawkgirl ponder how to trap Byth, they head back to the Veil of Valmoora, and recall their first meeting. We learn that, on Thanagar, marriage is signified by the type of earrings that a woman wears. 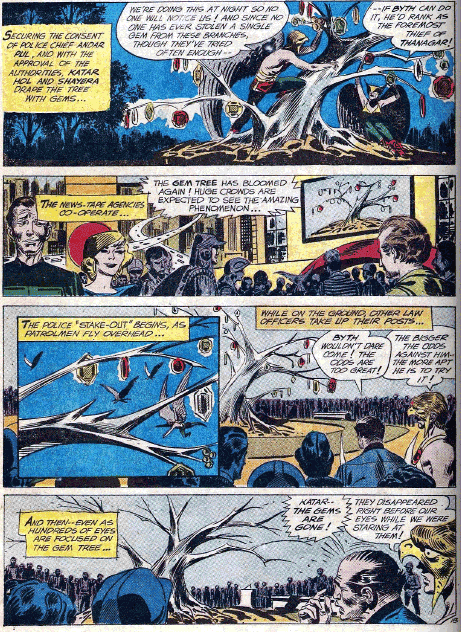 Earrings make Hawkman think of gems, and he comes up with a plan to lure Byth by pretending that a rare gem tree has gone into bloom. Byth and his allies succeed at robbing the tree, but Hawkman has coated the jewels in a radioactive substance, and is able to follow them. 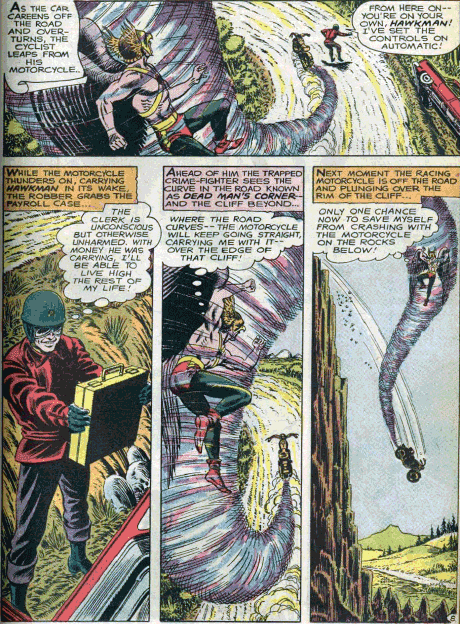 Byth tries becoming a mirage bird to confuse Hawkman and escape, but Hawkman outwits him. 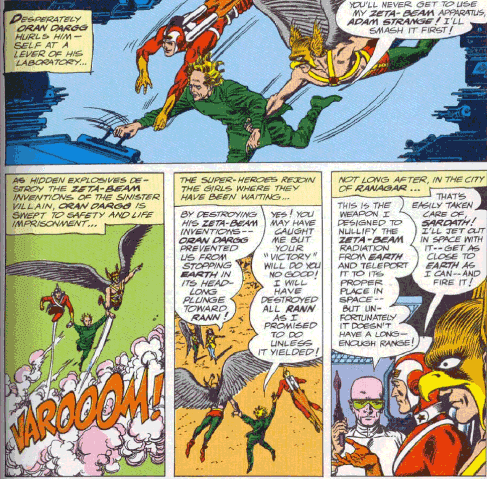 The story ends with Hawkman being awarded "honour wings" for his helmet, in consideration of twice capturing Byth. The wings make him look like Hawkman again. And I was glad that they were added as part of a plot point, rather than just sticking them on and pretending like they were always there. Hawkman and Hawkgirl return to Earth in Brave and the Bold 43. 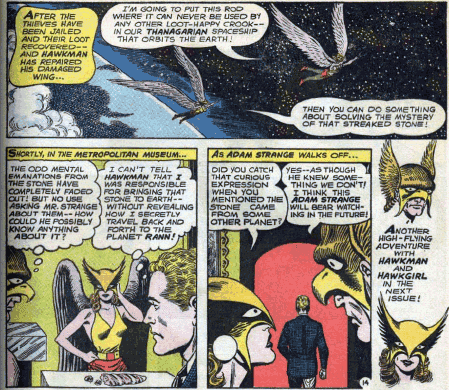 The tale opens on Earth, while the Hawks are still on Thanagar. Giant hawks, wearing human-like masks which emit deadly beams from their eyes, have arrived on the planet, launching a crime spree. Commissioner Emmett uses a subspace communicator to call the Hawks, and ask for their help. 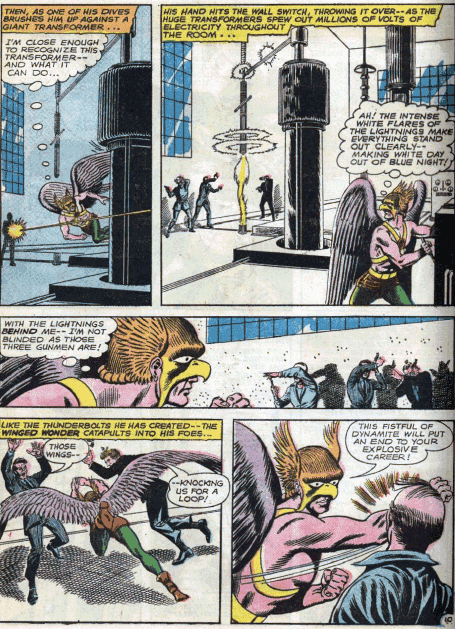 Hawkman recognizes the description of the giant hawks, that these are the Manhawks, an alien race that came to Thanagar years earlier. We get an extended flashback, which also introduces Katar Hol's father, and learn how Katar and his dad developed Hawkman costume, which would become the standard Thanagarian police uniform, to battle the Manhawks. The helmet itself is designed to protect the Thanagarians from the Manhawks' eye beams. 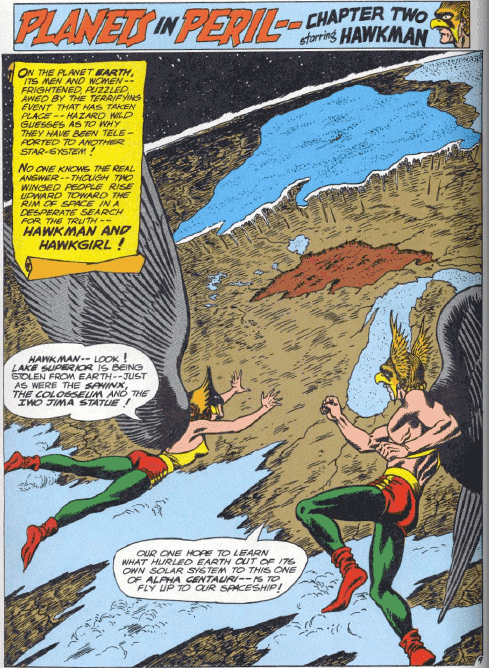 They succeeded in driving the Manhawks away from Thanagar. Hawkman and Hawkgirl return to Earth to help out against their former foes, but also seem inclined to take up residence there again. This also means resuming their human identities. Mavis Trent is thrilled to see Carter Hall again, and we learn that she, and presumably others, simply believed the Halls had gone off on a vacation. Hawkman and Hawkgirl face off against the Manhawks, who now seem to possess an invisibility beam as well. In fact, this turns out to be a temporal displacement beam, moving the items they want to steal into a future limbo. 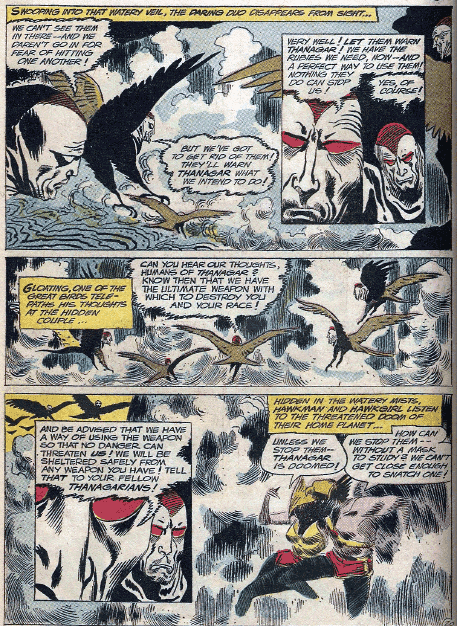 Hawkman has to come up with a new way to defeat, and finally succeeds by clogging their eyeslits with a chemical rain. 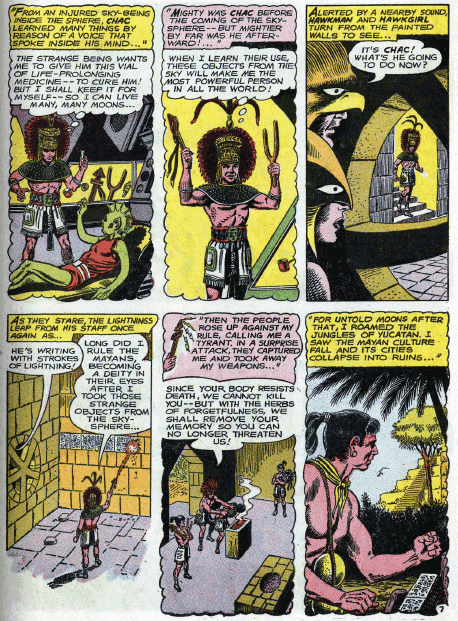 Brave and the Bold 44 ends Hawkman’s run in this book. The first of the two tales in the issue is quite a light story, though there are crimes in it. We learn that there is a traditional Thanagarian holiday called Impossible Day, when people are meant to perform three supposedly impossible tasks. Sounds a bit like the Darwin awards thing, meant to cull the population by encouraging dangerous actions, but in this story it plays out quite harmlessly. Using their advanced science, the Hawks make it rain upwards at a picnic, and throw lightning (in the form of solid rocks) at some crooks with a force field, in order to short it out. Lastly they deal with a thief who uses invisible bullets. Mavis Trent and Commissioner Emmett have small roles in the story. The second story introduces the Lanisarians, remnants of a long dead civilization on Earth, who are determined to move the planet back to its orbit from 10,000 years earlier. The Lanisarians resemble animals, but are native to Earth. Their plan is to alter the landscape of the planet, by moving its orbit, which will uncover their long-buried city, and they can revive their compatriots. Hawkman and Hawkgirl get on the case when the change in orbit causes gravity to go out of whack. It's a beautifully rendered, but very complex story, which is also kind of sad. The Lanisarian plan doesn't sound too feasible in the first place, and they had not taken into account to variation in the amount of hours in the day, so they even screw up their own plans, leaving it fairly easy for Hawkman and Hawkgirl to destroy their machine. 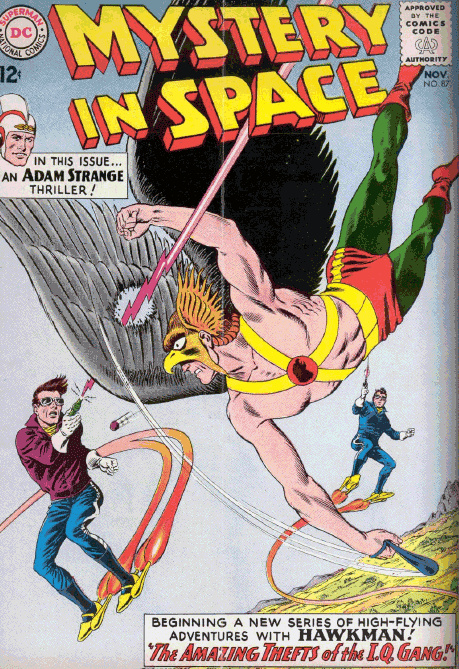 Hawkman begins a run in the pages of Mystery in Space with issue 87. 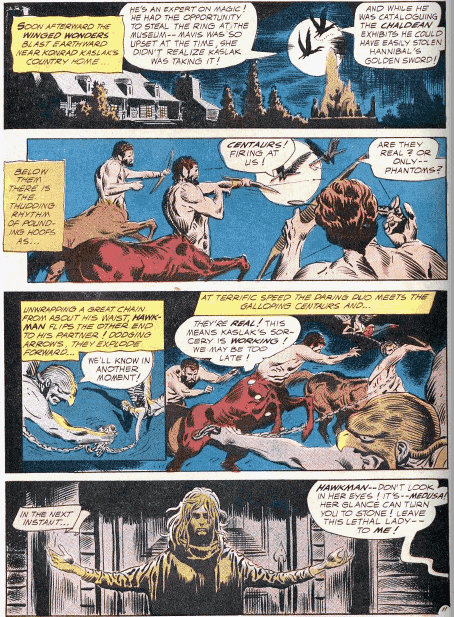 The run begins with a tale that continues, somewhat, from the Adam Strange story in the issue, and will culminate in the first teaming of the two heroes. 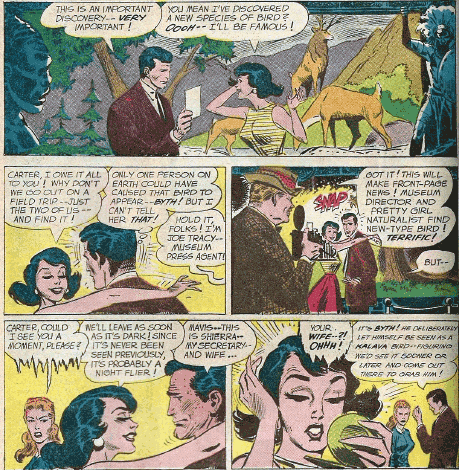 In this story, it turns out that the museum that Carter and Shiera Hall work at is also the one where Adam Strange deposits the rock he brought back from Rann. 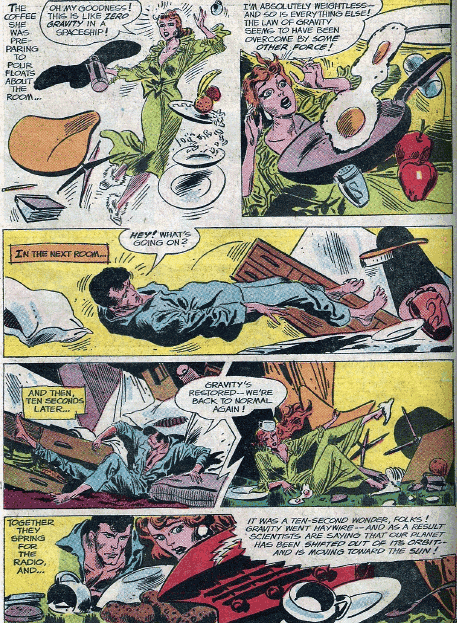 Ira Quimby, a two-bit thief, goes to rob the museum, but light rays hit the rock, and then him, endowing him with a super brain, if not a giant head like it did for Adam Strange. Ira adopts the name I.Q., and creates some flying shoes and other high tech devices to help him and his gang in their thefts. Hawkman and Hawkgirl go into action against him. The power wears off after a while, and I.Q. deduces that the rock was responsible for the situation, so he breaks into the museum to steal it again. He comes up against a security guard, and although he gets away with the rock, it gets broken in the fight, and piece gets left behind. 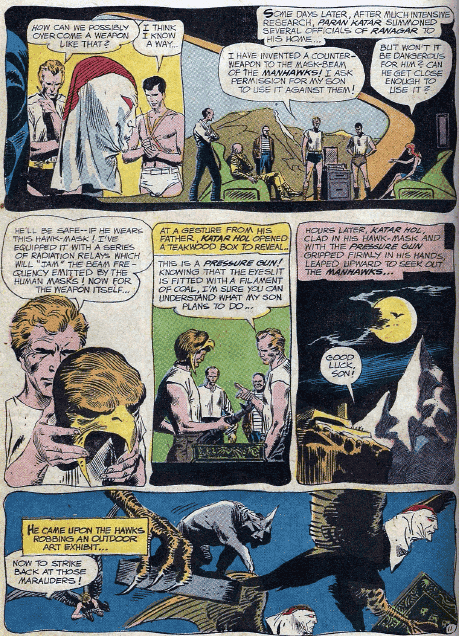 The Hawks examine it, and determine that the rock was not from Earth, and also find the brain-enhancing properties that it has gained, a result of the electrical effect caused by Adam Strange in the earlier story. Hawkman is also able to use it, and a Thanagarian tracking device, to find the rest of the rock, which is in I.Q. 's possession. They take the bad guy down, and bring the rock back to the museum. 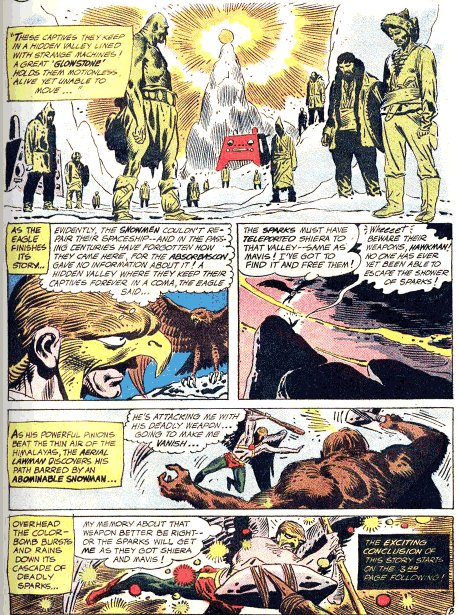 Adam Strange keeps the secret of the rock's origin, but the Hawks suspect that Adam knows more than he is saying. A lot of things go crazy in the Hawkman story in Mystery in Space 88, which begins with mechanical objects all over Midway City backfiring or working in reverse. Shiera Hall finds that her iron is freezing her clothes, rather than heating them. While Shiera is busy with the laundry, Mavis Trent gets her hair dyed, and then happens upon the room in the museum where the Hawks keep their costumes. She puts on the Hawkgirl outfit, and then what do you know, Hawkman shows up, and assumes this is really Shiera. Mavis has to keep silent to pull off her ruse, but does wind up accompanying Hawkman as he goes after the Master Electrician, the one behind the mechanical madness. It all makes for a really fun story, even if it sidelines both the real Hawkgirl, and Mavis as well, who isn't very adept with the wings, and won't speak so as to not give herself away. 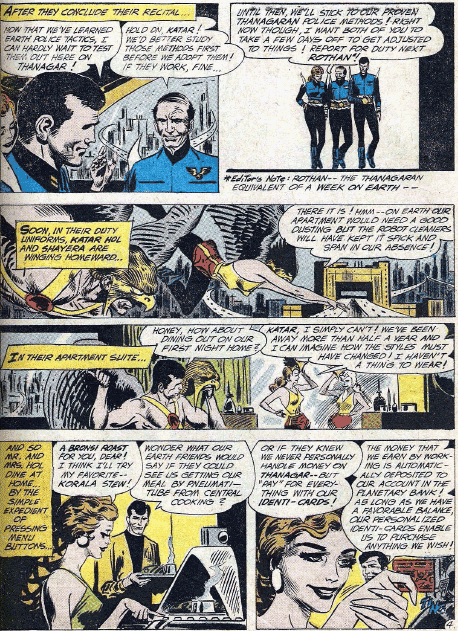 The real Hawkgirl does show up for the conclusion, and Commissioner Emmett has to come up with some vaguely reasonable explanation as to why the Hawks are using the museum to store their outfits. 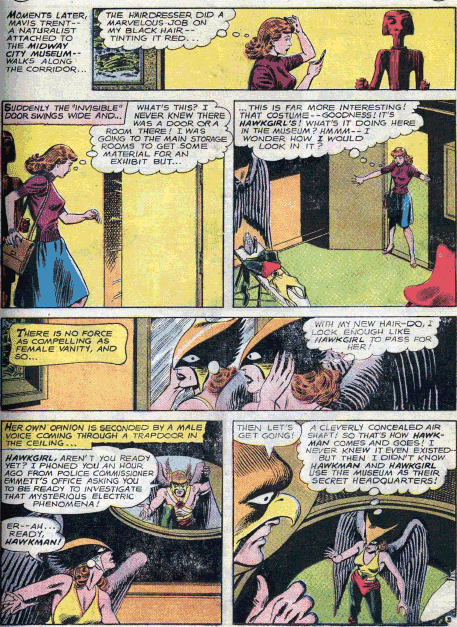 Mavis is left believing that Hawkman and Hawkgirl are not married, which leaves the door open for her to pursue him. But she still spends most of her time going after the openly married Carter Hall. 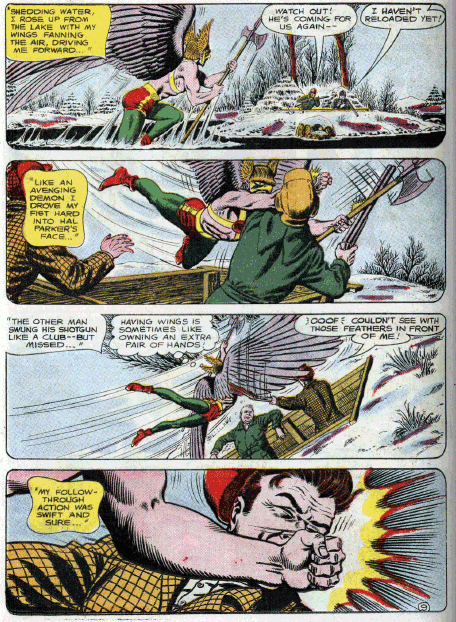 After this, Hawkman winds up working with Aquaman in a story in Brave and the Bold 51. The story begins with Aquaman and Aqualad dealing with an attack on Atlantis. Aquaman goes to consult an immortal, the Old Man of the Sea, who tells him about Tyros, an Atlantean exile transformed by exposure to a magical gem. He was cast out Atlantis, and vowed revenge, and has been biding time, also bring immortal now. 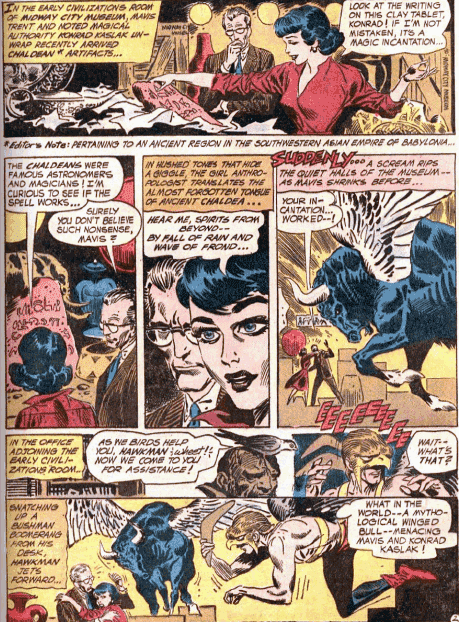 Tyros steals a magical horn, which grants him mastery of birds, and this brings Hawkman and Hawkgirl into the fray. Tyros is able to transform Hawkgirl into a harpy, and makes her his slave, which Hawkman is none too happy about. Using his control of birds and fish, Tyros is able to successfully take over Atlantis, despite the best efforts of Hawkman and Aquaman. The pair then split up to seek out the gem and the horn, destroying both. This not only removes Tyros' control of creatures, it changes Hawkgirl back to her normal form, and does so for Tyros as well. For two characters with no obvious connection, this is actually a pretty good tale. In Mystery in Space 89 Mavis Trent is overseeing a delivery of painting to the museum, which get hijacked by a man on a motorcycle, equipped with a sonic device. Mavis is upset about the theft, but more than eager to talk to a reporter who happens to be on the scene. 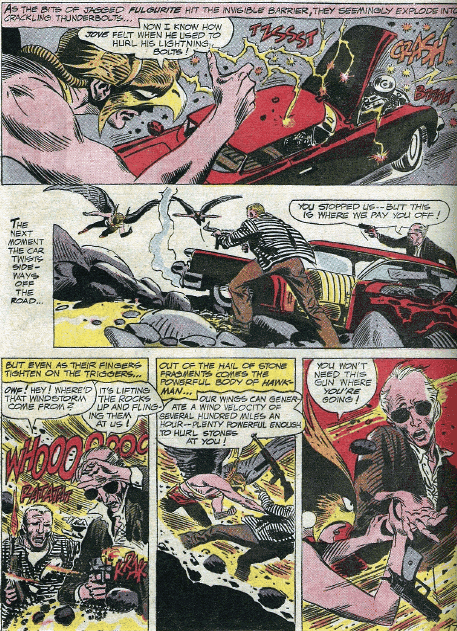 Using his bird buddies as spies, Hawkman finds out when the motorcycle thief is at it again, but does not expect it when the motorcycle proves to be able to emit a tornado, which he gets caught up in. He defeats the thief not through combat, but simply by trailing him back to his hideout, and finding out that he is really the reporter. It's not a great story, but the art is nice. Mystery in Space 90 ends Hawkman’s run in the book, but does so by delivering up the first Adam Strange/Hawkman team-up. Although this plays out as a straightforward super-hero team-up, with no politics or subtleties, it laid the groundwork that would eventually build into one of the defining elements in DC's cosmology, the rivalry between Rann and Thanagar. The story is divided into three chapters. The first is an Adam Strange story, the second a Hawkman one, with the team-up coming in the final chapter. I’ll discuss the Adam Strange chapter when I get to him. On Earth, Hawkman and Hawkgirl are dealing with the mysterious disappearances taking place on Earth, and make their first trip to the now nearby Rann. The Hawks meet with Sardath, who explains how the two planets are nearing, and how the gravitational forces will eventually rip both of them apart. With the planets so close, Alanna takes a small ship and flies to Earth to meet Adam on his own planet. There, they also meet up with the Hawks, and the four head off to confront Oran Dargg. Sadly, he then teleports them into two separate traps, which divides them into their usual pairings. At the very least he could have put Alanna with Hawkman and Adam with Hawkgirl. The couples each escape their traps, and get back together, long enough for Adam and Hawkman to jointly capture Oran Dargg. The story ends with Adam commenting on how good a team the Hawks make, and seeing that marriage has helped their relationship, rather than hinder it. He proposes to Alanna. As it turns out, this is a long engagement, as the couple do not actually marry for over ten years. A couple of weeks before the conclusion of his run in Mystery in Space, Hawkman, along with Hawkgirl, move into a solo book, Hawkman. 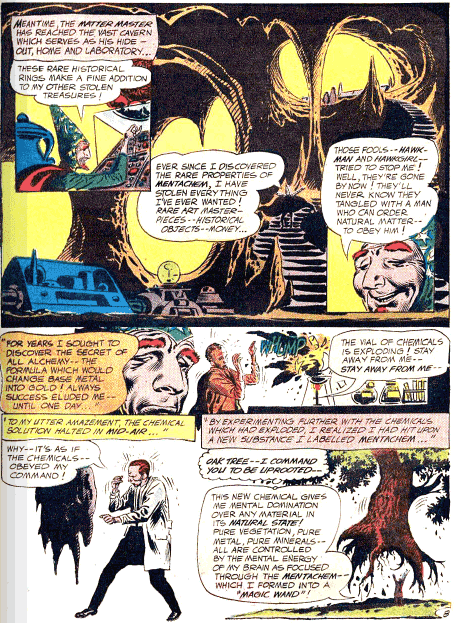 There are two stories in the issue, both by Gardner Fox and Murphy Anderson. The first story sees Katar and Shayera Hol back on Thanagar, reporting to their superior, Andar Pul. Pul had last been seen a couple of years earlier, in the Brave and the Bold. 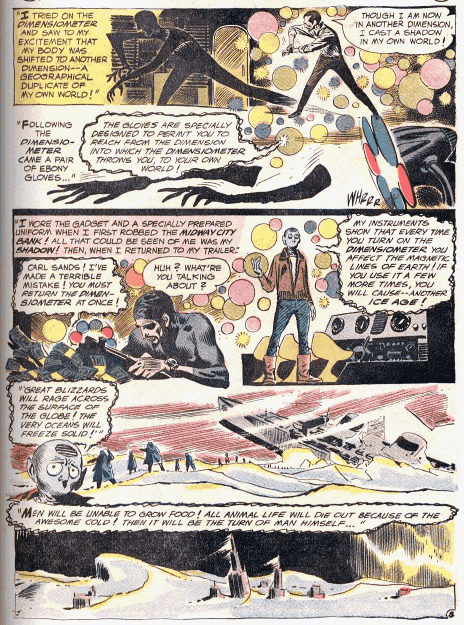 The Hawks give their report on the police methods of Earth, which includes a number of flashback panels to stories from Brave and the Bold and Mystery in Space, including battles with Byth and the Shadow Thief. They also tell Andar Pul of one hitherto unrecorded adventure, after some rare pearls were stolen from the Midway City Museum. 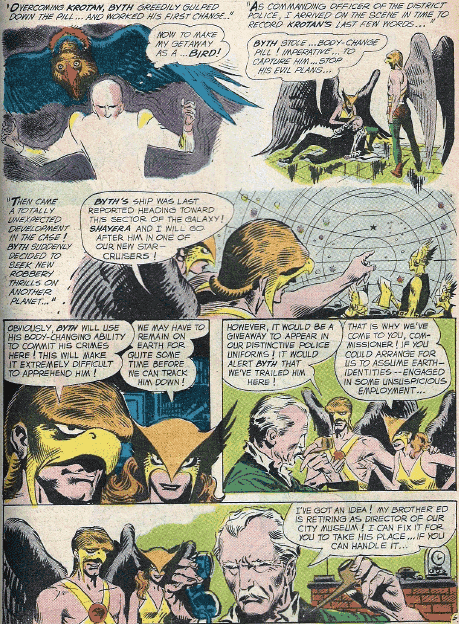 Commissioner Emmett appears in this flashback, in which Hawkman and Hawgirl decide to pit Earth and Thanagarian methods of crime detection against each other to find the thief. There is really no doubt that Hawkman, and the Earth methods, are going to win out in this contest. Hawkgirl does her best, but Thanagarian methods are heavily reliant on their advanced technology, which seems not to function very well on Earth. On the other side, concepts like figuring out who the bad guy might be by looking at the modus operandai of thieves are treated as something uniquely human, as if Thanagarians had technology, but no common sense. At any rate, Andar Pul agrees that Earth methods are superior, and sends them back to learn more nifty tricks. The flight back was pretty quick, because as of the second story the Hawks are back in Midway City, and have resumed their human identities. Mavis Trent gets a very small role in this story, coming back from an expedition to the Yucatan. She had last been seen a couple of months earlier in Hawkman's series in Mystery in Space. Mavis recalls nothing about the trip she just took, and doesn't even know her own name, so the Hawks use the absorbacon to retrieve her buried memories. They cannot find out anything about what Mavis experienced down south, so the Hawks head there themselves. The villain in the story is Chac, a Mayan priest, who discovered ancient weapons that came from a crashed alien ship. He gained immortality, but also suffered memory loss long ago. 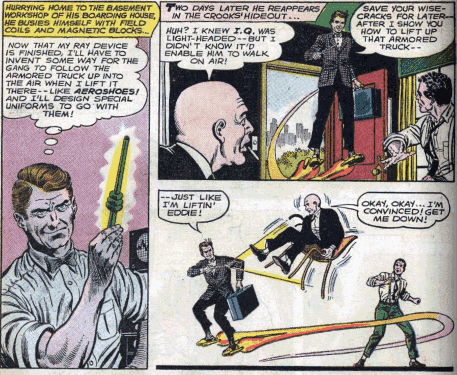 He served as Mavis Trent's guide, until he read the inscriptions, and learned about his own powers and weapons. Chac uses his weapons against the Hawks when they come. Much like the weaponry that Hawkman and Hawkgirl use, there is an alien basis to them, but they resemble weapons of the past. This makes him a really good villain for the pair, and it's a shame that this was his only outing against them in this book. Chac did return for one more adventure, in Justice League of America the following year. The Hawks use their tech to read the Mayan inscriptions, learning all about Chac's weapons, and also how to cure Mavis Trent's amnesia. 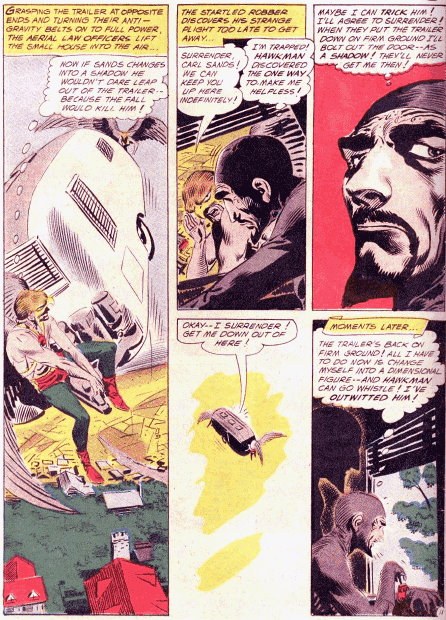 Hawkman continues in the next period, 1964 – 1967: the New Look. Next up – Johnny Thunder!